At 4 PM a crowd of old men, some women and a bevy of small boys gathers at a church with a walled courtyard outside Hawzien in Tigray, the northern province of Ethiopia tucked in the mountains near Eritrea. It’s desert here, goats forage in the sand and birds rise and fall under intense blue sky. And it’s the drowsiest time of a hot day, when the sun and the buzzing of the insects conspire to make me want to simply go indoors, anywhere, and take a nap. But clearly, the crowd around the church means that something is going to happen. It’s the eve of Timkat, Ethiopian Epiphany, and the people are excited. The boys circle around the few westerners, maybe ten of us, all in travel gear carrying cameras, “What is your name?” “Can I have money?” as the men and women haunch in separate groups watching the church – where nothing appears to be happening! A few minutes before 5 PM we hear drums from behind the wall, the women ululate in response and the boys’ running becomes more animated. This continues in the same manner for a half hour or so. Festivals in Ethiopia unfold slowly, the promise of an event fighting with the boredom of nothing happening for long periods of time. An umbrella, red, decorated with gold spangles and fringe, is sighted above the wall. The ululation increases in volume and all cameras swing in that direction. Then finally, just as the sun begins to set and the light becomes lovely, the courtyard door swings open and a procession begins. And it’s worth the wait. Forty young people – teens to twenties, robed in white scarves and simple vestments – parade toward us, led by two drummers who strut and gesture like drum majors. The youths sing and clap and the crowd joins in, the beat increasing a bit with each repetition. Behind them are the priests, a snaking line of thirteen robed in mix of red, green and yellow vestments, each with umbrellas, each umbrella more magnificent than the last. And that last is truly the best. It is large and square, and it is held over what must be at least a bishop – a man with a handsome black face, a balding head, and the white beard of a prophet. He carries a large box covered with a gold cloth. We realize that this is the church’s replica of the Ark of the Covenant, the focal point of the ceremony, that will be transferred to a tent on a river a few hundred yards away, that will be guarded by the people of the village who will celebrate all night around it. Jim and Maynard run to get photos of the priests, who seem unperturbed by the attention, but who mostly just drop their umbrellas to forestall close-ups. Not a problem, since the two groups continue to stand in that position for another 30 minutes giving our photographers plenty of time to find willing subjects and get their shots. The wait is for a similar line from another church which comes over the hill and joins our group. Then the march to the river begins, the crowd joins the official celebrants, and we walk a few hundred yards to the waiting tent. 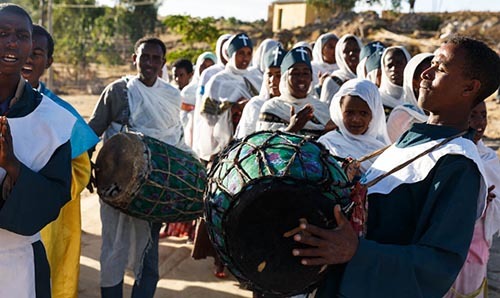 Timkat has been celebrated in the same way at every church in Ethiopia for at least 700 years, commemorating the baptism of Christ by John the Baptist. There is always a body of water, referred to as the River Jordan during the mass held on its banks, although the water may be only a small pool constructed for the occasion. At the end of a day of celebration, the replica of the Ark is returned to its church. Timkat is a combination of a religious aspect for a devout group of people and a chance to gather, sing and dance, and take a day off from working. Just like Christmas, just like Easter, in the West. Sounds fascinating, when do we see pictures? Looking forward to the next installment. Ray gets a new knee tomorrow-such fun. You are an incredible writer, Patton! Wish I were with you–sounds like you managed to avoid the tourist hordes for Timkat in Lalibela and Axum. Loving every word and photo! Just catching up with your blog today. Wonderful descriptions. My favorite, “it’s the drowsiest time of a hot day”. I could just feel my eyes wanting to close with the heat of the day.